Since Pittwater Online News commenced we have taken every opportunity to speak to local resident female and male Veterans who have served Australia to record and publish what they have seen and experienced. During this time an awareness that many who have served in our Defence Forces of Navy, Army and Air Force are challenged about where they wear their medals, or looked at by puzzled others because they do not 'fit' the traditional idea of what a Veteran looks like, has grown. Just so we all understand - If wearing your own medals, they should be placed on the left-hand side of your chest over your heart. If wearing someone else’s medals they should be positioned on the right-hand side. Some veterans are challenged about their medals because they look too young to be a veteran. We were all young once though and Veterans are young, old, male, female, current and ex-serving members of the ADF. For a few years now a series of initiatives have been undertaken by community members and the ADF and DVA to broaden the understanding of civilians on the roles Defence personnel undertake and what a contemporary Service person may look like. With so many of our fellow men and women still serving in overseas operations, their reentry into civilian life once they leave can be made easier by extending a welcoming hand and listening or supporting what we may have no real experience of what these fellow citizens have been through. The transition from Defence life to civilian life is not easy for those who have served, and this affects their families too - their spouses and children. Although a range of programs are now beginning to have some effect, we are still losing too many who come home and still cannot come home in their self. You don't need to be a statistician or avid follower of the news to be aware of that. That's why we'd ask you to, please, be supportive, be caring, extend a hand and lend an ear on a day to day basis, not just when we're honouring those who have Served and Serve still on days set aside to commemorate the fallen and honour the living. And that's why we'd ask you to, please, next time you see a woman wearing her medals on the left, please thank her for her service. 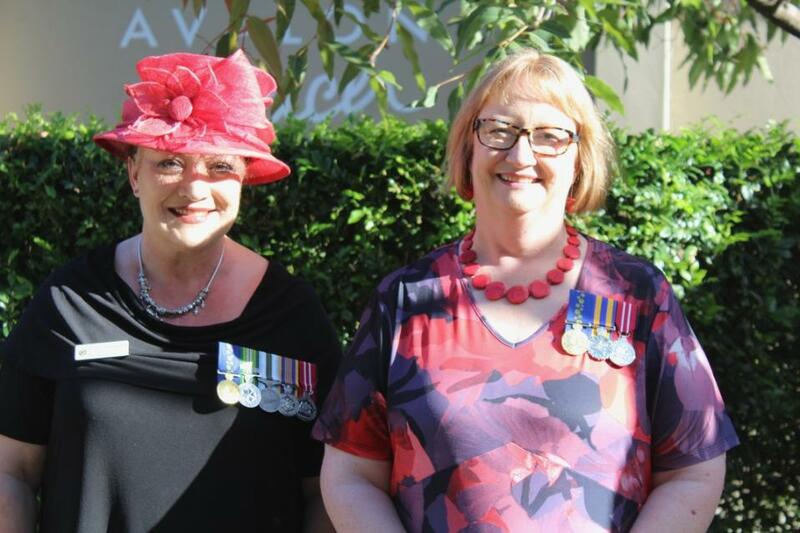 That’s the message members of the Women Veterans Network Australia (WVNA) seek to promote through their By the Left campaign in the lead-up to Anzac Day this year (the title is a play on words as ‘by the left’ is also a phrase of command used when marching). There will be an especial element to the Avalon Beach RSL Anzac Day March in 2018. As a one time initiative, all current and ex-serving women are invited to march as one. All ex-service organisations including WRANS, WRAAC, WRAAF, AWAS, Ex Service Womens, WVNA, APPVA, RAANC are invited to participate and proudly parade their banners in one rank at the front of the combined female veteran group. 'By the Left' needs us all to be part of this positive change. That's why we've asked Tamara Sloper Harding and her good mate Jan-Maree Ball to help us spread the message this year. You can read In Advance Of ANZAC Day... My Two Cents Worth.... by Jan-Maree Ball OAM in this week's Issue. While Tamara Sloper Harding OAM runs as our Profile of the Week with a focus on her own Service record rather than the focus on her passion, The Pittwater Friends of Soibada, Pittwater Online ran during the early days of this news service - and which probably means yet one more 20 hour day has been done by her this week. Thank you Tamara - thank you for your Service. As the daughter of a Royal Australian Naval Officer and being one herself, Tamara has lived at many different places and travelled extensively. She was born at Liss in England but also lived overseas in Hawaii and again in the United Kingdom during postings for her father. She commenced her education at St Kevin’s, Dee Why, continued at Haslemere in England before returning to St. Kevin’s and then Mater Maria, Warriewood. Tamara completed secondary schooling at St. Clare’s in Canberra before commencing a BA at Canberra University and then joining the RAN in January 1987 at the Australian Defence Force Academy, completing her training at HMAS CRESWELL, Jervis Bay in 1988. Tamara has an extensive personal and family association with the Northern Beaches of Sydney. Her grandparents owned property in Trappers Way, Avalon before moving to Collaroy for over 40 years. Her parents did the reverse, owning at Collaroy before retiring to Avalon. Her mother was a very active supporter of the Long Reef Surf Club before her marriage. Of her two younger siblings, both born at Mona Vale hospital, her sister is a special needs teacher at Barker College while her brother, a lawyer, and his family live at Freshwater. Her initial postings in the Navy were as an Administration Officer, generally in personnel management and community support areas, including Public Relations and media. This included time at sea onboard HMAS STALWART and HMAS TOBRUK. 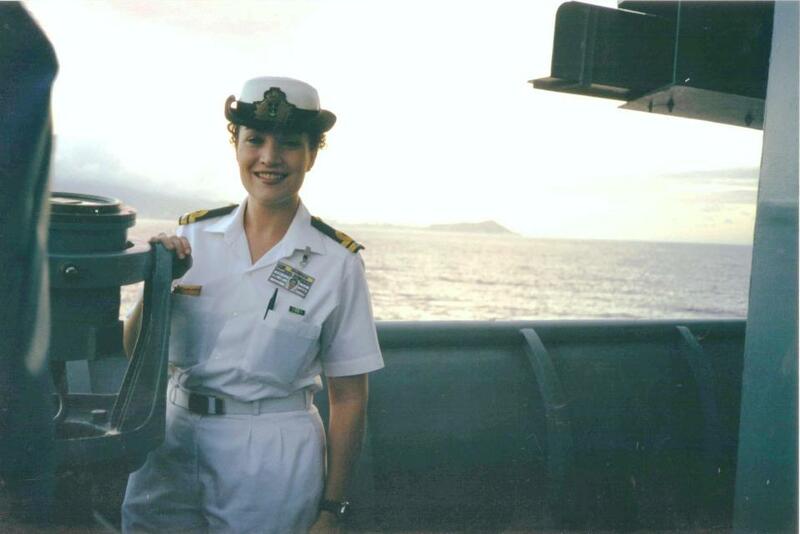 After qualifying as an Intelligence Officer, Tamara had operational postings in Maritime Headquarters, Headquarters Australia Theatre, at sea in USS CORONADO, Bougainville, Papua New Guinea, and finally as a member of the Interfet peacekeeping force under General Cosgrove in September 1999 in Timor Leste (East Timor). Her exposure to the sufferings of the civilian population following the atrocities during the Timorese struggle for independence, led to her passionate involvement and desire to provide assistance. She became involved with orphanages and schools, organising food and aid packages to be sent to her for distribution while there and has continued this since then. Her marriage to Adrian Harding, an Army officer, took place in September 1999, again keeping the Northern Beaches association, at St. Patrick’s, Manly. (She received the phone call about the deployment to Timor Leste during the wedding reception.) They have four children and, on settling in Avalon, Tamara transferred to the RAN Reserve (Inactive) as a Lieutenant Commander after almost 19 years in the RAN. Adrian working in a civilian defence support capacity, remains an active Army Reservist Lieutenant Colonel. At Avalon Tamara became very committed to community engagement. She foundered and chairs the charity, Pittwater Friends of Soibada Inc. She is a member of the Upper Northern Beaches Rotary Club and on the College Board at Mater Maria Catholic College. She is a member of the Outreach and Social Justice Team at Maria Regina School and a regular guest speaker on social justice at many other local schools and community groups. Tamara has recently become the Avalon RSL Sub Branch Schools Liaison officer. She is a member of the Northern Beaches Social Justice Network – Meeting of the Minds and is Director of the Social Justice Ministry for the Catholic Parish of Pittwater. Tamara is an active participant in the Alola Foundation, involved in fundraising since 2005. She has supported the Cancer Council with Daffodil Day for many years and has held a “Girls’ Night In” for women’s cancers at her house for 5 years with up to 200 attendees as well as being involved in the Blood Bank since 1990, coordinating buses, publicity and volunteers. In March, 2011 she was honoured with the award of Pittwater Woman of the Year. Tamara has also received The Rotary International Service Award in recognition of outstanding human endeavour contributing to international peace and goodwill. On Australia Day in 2016 an Order of Australia Medal for her work for the communities of Timor Leste and Pittwater was awarded. I guess it was inevitable that I would end up in the military. Not only has my family been tied to the Defence force through many generations but I came about as the result of a Mess Dinner. To top that off my parents gave me the initials of the course my Dad was on in the UK at the time. The Torpedo Anti Submarine course – Tamara Anne Sloper. When I was a teenager I really thought I knew what I wanted to do with my life. I wanted to be a counsellor, intelligence analyst, writer/journalist, fashion designer and artist. Strangely enough, even within the military I have had a go at all of these! I applied for a scholarship to join the Navy when I was in Year 10. I was in the full time Navy for almost 19 years and am still in the Navy Reserve. I am now a full time mother to four children. I can tell you that this job is more challenging than anything I ever did in the Navy and without the glory or the medals or even the pay! Being an older mother and after the excitement and thrill of my career I have found it difficult to settle down to domesticity. I have no time for paid employment (much to my family’s disappointment!) yet there are moments in my day that can be put to good use for a greater benefit. That is where my involvement with the people in the small village of Soibada in Timor Leste fits in. My initial postings were as an Administration Officer, generally in personnel management and community support areas, including Public Relations and media and staff officer roles. This included time at sea onboard HMAS STALWART and HMAS TOBRUK. I am sure that you are all aware of the challenges that faced young women in the military in the late 1980s. After I qualified as an Intelligence Officer, I had operational postings in Maritime Headquarters, Headquarters Australian Theatre, at sea in the American ship, USS CORONADO, in Bougainville, Papua New Guinea, and as a member of the Interfet peacekeeping force under General Cosgrove in September 1999 in Timor Leste (East Timor). Even as a Naval Officer I always considered myself to be a peacemaker. We got married in Manly at the Cardinal Cerretti Memorial Chapel at St Patricks Estate on 11 Sep 99 – a date that was later to become very significant to the world for such dreadful reasons. Both Adrian and I had attended military leadership courses there when it was still a seminary. So it had special meaning for us. We had a military wedding. (Lots of our guests ended up being in Timor with me in the following weeks.) One day I was dressed as a bride the next week I was wearing a helmet, body armour and carrying a steyr rifle. In 1999 I began a journey, a journey I wasn’t too keen on taking at the time, but it was something that changed the course of my life and has had much more far reaching consequences than I ever envisaged. It was the path to a friendship that was to develop not just between me and the small village of Soibada in Timor Leste but a friendship that has grown to embrace the community of Pittwater on the Northern Beaches at so many different levels. My exposure to the sufferings of the civilian population following the atrocities during the Timorese struggle for independence, lead to my passionate involvement and desire to provide assistance. I became involved with orphanages, schools and local womens groups. I witnessed the results of the years of occupation and violence in Timor Leste and felt the true courage and strength of the Timorese spirit. However, I did not truly understand the full impact upon the women and children until I had children of my own. I also did not fully comprehend the journey of friendship I was embarking on in 1999, nor did I anticipate the love I would grow to feel for the East Timorese people. It has been a life changing experience that has influenced every aspect of my existence. I am fortunate to have lived a very full and exciting life so far. A life that is full of challenges and ultimately positive outcomes – although I often overlook this during the daily struggle of the family routine. Life today is so hectic it’s easy to lose sight of what is really important and meaningful. I do believe that every experience both positive and negative has led me to where I am now. I have been shaped into the person I am and given the skills to cope with nearly everything that is thrown at me. It all does seem to be part of a bigger picture, and a plan. It has not all been smooth sailing and at times it has been difficult for me to accept what I have been called to do. As a young person I did wonder – what is my purpose? What is my role in life, how will I know if I am on the right path. I needed a cause, something to be passionate about for my own sense of self as much as for any desire to help others. My search for meaning did not begin with huge plans to change the world. I did consider that serving in the Navy was a way to fulfil my desire to contribute to the community. The obligation of social justice does fall upon each of us as individuals. One person can make the world a better place even through small acts of kindness. There are so many problems in our world at the moment. It can be overwhelming and difficult to know where to start - or if to try at all. I am only now just coming to grips with being my own person – my goals and my purpose are becoming stronger than my fear about what other people think. I have also had to learn in the last few years that my role has changed. Although I am no longer out there in the thick of it as I was when in the Navy – physically making a difference both here and overseas – I can have just as much, if not more impact and make a difference in the world since I had my children. I am now responsible for the development of those four small people’s attitudes towards others, their world and the difference they can make in it. I need to raise globally aware children with a keen sense of social justice and gratefulness for the wonderful life we have here in Australia. Not just my own children but for the children of our community. I spend a lot of time speaking in schools, to children of all ages and hope to impart some interest in the world and our neighbours. The young people today are the ones that will change the world and eradicate poverty. …If I can instil in them awareness about our impoverished neighbours, compassion, energy and drive to do something about it then I am fulfilling what I believe to be the purpose for my life. My life has turned out to be much fuller than I ever imagined and to have a more far reaching impact. I had a wonderful exciting military career but I always hoped for a family. I still have unfulfilled dreams and goals but that is what provides the challenge I need. There are many aspects of motherhood that I did not anticipate. All that time in the military and all that study did not prepare me for some of the challenges of community and civilian life! There have been very many tough times. Times I wondered what on earth I was doing involved in situations and strange places! As many of you may know I was not exactly a conventional military officer! However my eccentricities did prove quite useful on some occasions. One of the most difficult times for me, and it haunts me to this day, was during my deployment to East Timor. For a start it was not where I expected to be during my honeymoon. I was one of 2 women accommodated with 40 or more men. The type of weapon I was issued was new to me as was the responsibility of carrying live rounds. It was the wet season, nothing like the rain we experience here. The rain was so heavy and the actual raindrops so thick, that your eyes would literally fill with water and it became difficult to see. It was heavy enough that you could wash your hair in it. This weather rendered the unsurfaced roads extremely dangerous. I had met an Australian aid worker when I was visiting an orphanage in the hills. She called me late one rainy night to tell me a child had had an accident and to ask me to bring the army doctor. My instant response as a caring human being was to get ready to go without a thought. However, it was then that my military training kicked in. There was much more at stake here than the wellbeing of one child. I knew for a fact that the area surrounding the orphanage was not safe. It was dark, there are no lights in the jungle. The roads in the mountains were extremely dangerous with large parts washed away (I had in fact been in a vehicle that slid off the side of the mountain the week before). If the doctor went to the orphanage it would be placing Australian troops that would accompany him at risk from both the roads and the militia. Ultimately the decision was not mine – however, I did have to provide the recommendation to the senior officer. The consequences of allowing people to go to the aid of this child would be too far reaching. Thus, I recommended that the doctor did not go – and I believe that the child died as a result of her injuries. There have been many unusual and humorous incidents too. There was a really funny incident when I was on picquet with another officer around the perimeter of our camp in Timor. It was the middle of the night – it always seemed to be the middle of the night whenever I was out there - we were scared, (but he probably wouldn’t want me to tell you that) and we really wanted the guys on the other side of the fence to know we were there. We didn’t want to want to give them a fright and have them shoot at us. So we decided to sing – it filled in the time too. Strangely though, the only songs we could both remember were those fabulous groovy hymns from the 1970s. The ones my year three teacher at St Kevin’s in Dee Why, taught me. So we began to sing “Lord of the Dance”. To our amazement the guys outside the fence, the ones we were keeping out, joined in. The next year when I was in Bougainville attached to the Peace Monitoring Group the benefits of being a woman in the field and of being prepared for anything really showed true. The small helicopter that I was in crash-landed due to engine failure. At first I thought the Load Master was joking when he shouted “crash positions”. When I realized it was for real – we were going down over the jungle – I wasn’t worried, it was so surreal. Fortunately, nobody was hurt. Luckily, and much to the amazement of the guys, I had Robert Timms coffee bags and a tube of condensed milk in the pockets of my camouflage pants. So we lit a fire and had freshly brewed coffee whilst we settled down to wait for the rescue chopper. Several hours in the middle of nowhere with a bunch of blokes is a long time and can get a little dull – even with fresh coffee. It was just as well that I had my latest crochet project in my other pocket! The strangeness of the scenario did not end there however. After a while people started to appear out of the jungle. People, with items to sell to us. It was incredible, I bought some lovely baskets to keep the crochet in and a number of sarongs – with NSW Rugby printed on them. As we went back to base in the rescue chopper the guys voiced their amazement that even in the middle of nowhere I still managed to shop, have coffee and crochet! Having served in this region and witnessed the results of the atrocities inflicted upon the Timorese people I am extremely concerned about what is going on in West Papua at this very moment. You still serve but now in the community in many other capacities; Vice President at Avalon Beach RSL Sub-Branch, the current Rotary President for the Upper Northern Beaches branch, Chair of Pittwater Friends of Soibada (PFOS)as a Mater Maria College Board Member, The Catholic Parish of Pittwater Social Justice Director as well as attending numerous speaking engagements in local schools, clubs and functions – why do so much to serve still? I have difficulty seeing something that needs doing and not taking action. People complain about things not being right – well nothing can improve or change unless we all actually do something. You can create positive change from the inside – be a doer and make a difference. There is so much more I need to do. I am learning and I make mistakes – by taking on so many roles I can’t give enough time to all of them. They do overlap however. I wish I had time to do more in all of these things. Mostly why I volunteer comes back to the whole ‘service before self’ ethos I’ve grown up with – for many people this is not just a phrase, it’s something they do day ion and day out, for all of their life. Many of the organisations I’m involved with now, such as rotary, are a lot like being in the Defence Force. You are surrounded by people who are putting others first, and that is very empowering. My mind is constantly churning and thinking of ideas - things that would be great to do. I never planned on taking up the RSL role but there is such a huge need with all the younger veterans coming home now. The suicide rate amongst them is horrendously high. We saw it when our troops returned from Vietnam and now history repeats itself. We need to take care of these men and women who put their lives on the line – who volunteered to keep our nation, keep us safe and try to bring peace to the world. To me that is what drew me to the ADF – the opportunity to bring peace to the world. I gain so much from volunteering. It has helped me integrate into the civilian community. I really missed the closeness of my mates in the ADF. How do get that as a civilian? A sense of purpose has helped me with my PTSD. • Older adult volunteers live longer than non-volunteers. Studies report that engaging in regular volunteer work increases life expectancy because social interaction improves ‘quality of life’. Tamara Sloper Harding OAM and Jan-Maree Ball OAM at Avalon Beach RSL Club this week.